There’s rich and then there’s crazy rich. 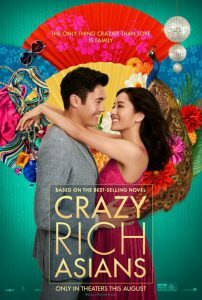 Based on the 2013 book of the same name by Kevin Kwan, Crazy Rich Asians is adapted for the screen by Peter Chiarelli and Adele Lim, and directed by Jon M. Chu. At the film’s core is Rachel (Constance Wu), an economics professor in New York who is invited to Singapore by her boyfriend, Nick (Henry Golding), to meet his family. Unbeknownst to Rachel, Nick belongs to one of the wealthiest families in Asia. As they all prepare for Nick’s best friend Colin’s (Chris Pang) wedding to the vivacious Araminta (Sonoya Mizuno), Rachel realises she may be in over her head. Nick’s mother, Eleanor (Michelle Yeoh), doesn’t approve of Nick’s girlfriend from the west, and goes to significant lengths to break up the relationship, all the while trying to put up with her own mother-in-law (Lisa Lu). Nick’s cousin, Astrid (Gemma Chan) seems to have it all, but her marriage to Michael (Pierre Png) is suffering. Ronnie Chieng and Remi Hii play Nick’s wanker cousins, Edison and Alistair, and Awkwafina is a highlight as Rachel’s friend, Goh Peik Lin. (Ken Jeong and Chieng Mun Koh as her parents are also great value). It’s really a woman’s show, with the women getting all the meat in the plot, while the men are mostly there to look good or produce laughs. Nick’s father is spoken about, but never seen. Whether that’s a comment on the absent father or to show that women are the one’s running the show is not entirely clear. We are all in on Rachel’s side though, as she tries to deal with this crazy new world. Constance Wu is perfectly cast as a leading lady we can immediately warm to. Michelle Yeoh, in contrast, nails the death stare as the matriarch who wants the best for her son, even if it’s clearly not what he wants himself. Late in the piece the two women engage in a Mahjong showdown and it’s delicious. And speaking of delicious, the dumpling-making scene is also a highlight. As the title suggests, the bulk of the characters in this film live a life of extravagance. They’re disgustingly rich. Like a $40 million wedding kind of rich. You know those tacky rich people you know who have gold décor everywhere because they think it looks “classy”? They’re the plebs here. Some viewers may find it all too gross (there are people living in poverty, after all) but the film doesn’t really promote such extravagance – although it does all look absolutely gorgeous – and Rachel is not won over by money. This isn’t Fifty Shades of Grey, thank god. If anything this film may encourage some viewers to run as far away from big money as they can. Or at least rich and powerful in-laws. The film is accompanied by a peppy soundtrack that includes some Chinese pop covers of Western hits (Coldplay and Madonna among them) which further highlights the blending of Asian and Western cultures on screen. I mean, who doesn’t love a fashion montage set to a Chinese cover of ‘Material Girl’? Along with the music, the vibrancy of the costumes and lavish set-pieces make the whole film shine from start to finish. It’s refreshing to see a Hollywood film that features a cast of entirely Asian actors – the first in 25 years following The Joy Luck Club. And given how enjoyable the film is it should reach a wider audience rather than only the population it represents. While Asians living in the West will likely relate the most, this is a film that can be appreciated by all. It’s not exactly genre-defining – let’s face it: it’s a Hollywood chick flick – but it’s a damn good time with laughs galore. In contrast to the recent The Spy Who Dumped Me which produced merely half smiles and the occasional titter, Crazy Rich Asians is actually hilarious. However, it also succeeds in its dramatic moments, and don’t be surprised if you end up teary-eyed in its cute, even if somewhat clichéd, final moments. Narrative-wise, it’s pure Hollywood, but it’s importantly a progressive step in mainstream representation. This review was first published on 27th August 2018 at Film Blerg.